Lovin’ Spoonfuls is a Boston-based organization with a dual mission: reduce food waste and feed the hungry. By salvaging food from wholesalers, retailers, and farmers, they are reducing the amount of food going to landfills. 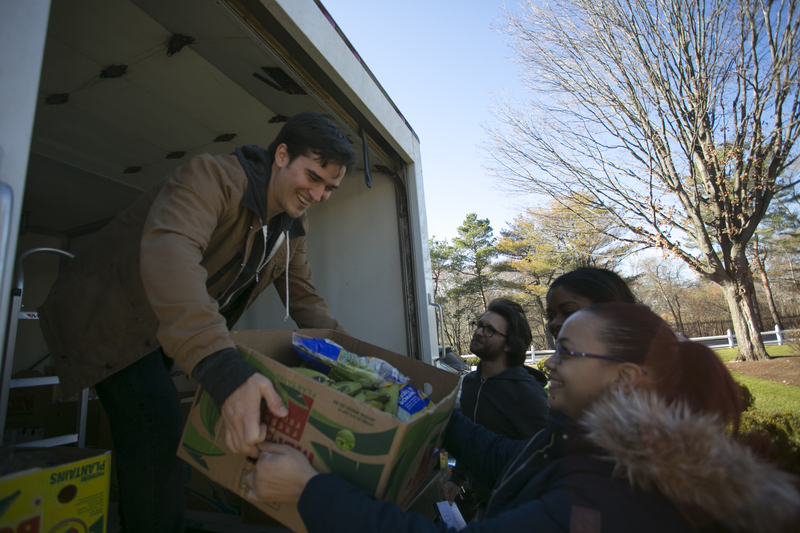 They then distribute the food that would otherwise go to waste to partnering nonprofits that feed Boston’s hungry. By concentrating on wholesome, fresh food products, they not only contribute calories, but also health to the communities they serve. While their mission may seem more oriented towards social and economic concerns, Chief Operating Officer Lauren Palumbo sees Lovin’ Spoonfuls’ work in a distinctly environmental light. Food Tank talked with Lauren about food rescue, the environment, and what we can all do to limit our food waste footprints. Food Tank (FT): What is the environmental impact of wasted food? How does Lovin’ Spoonfuls serve as both a social justice and an environmental justice organization? Lauren Palumbo (LP): Food is one of the most resource-intensive industries we have, with significant use of water, fertilizer, human labor, oil for transportation and more involved throughout the food system. With 40 percent of food going to waste in the U.S., that means the resources to grow and distribute the food also go to waste—25 percent of our freshwater, 300 million barrels of oil annually, and countless hours of labor. Once wasted, if landfilled, organic waste emits methane when decomposing, which is more than 20x as harmful as carbon dioxide. I often say we are first and foremost a food waste agency; we are here to prevent the above-mentioned waste from happening, which is mostly a focus on the environmental impacts. Because there are simultaneously millions of food-insecure Americans, our best solution for the food we rescue is to feed people. We connect the food we rescue with food insecure families and individuals in the communities we serve, and in doing so, provide access and choice to fresh, healthy produce, dairy, proteins, and prepared foods. As an organization, we believe that access to this food is a right, not a privilege, and we are fortunate to play a part in achieving that goal. FT: What do you see as the largest challenge in reducing food waste in our food system? What is Lovin’ Spoonfuls doing to address this challenge? LP: Because so much food is wasted at the consumer level—nearly half of the 40 percent—education is crucial. We support the efforts of the Harvard Food Law & Policy Clinic, the NRDC, Save the Food, ReFed, and other leaders who are working to educate consumers on ways to prevent food waste at home. Beyond consumer efforts, the retail and wholesale distribution sectors provide the largest potential for food waste reduction, and it is precisely those sectors that our operations are built to serve. To that end, we are working diligently to expand our footprint throughout Massachusetts and to serve more communities in need. FT: There is a large amount of wasted food that never makes it off the farm. Do you do any gleaning on farms or work with any gleaning organizations that make use of food that would be wasted in the farming and harvest process? LP: We do not glean, though there are organizations and volunteers that do, both in our region and beyond. However, we do work with a number of farms to rescue the excess product which they harvest. Because of consumer and agricultural uncertainty, farmers often harvest beyond what their needs are for the farm stand, the farmers market, or the CSA, and we work with a number of farms in Eastern Massachusetts to rescue that excess harvest. FT: Do you confront any regulatory or legal barriers to the work you do? Are there opportunities for regulatory and/or legislative changes that would support food waste reduction and/or help to reduce the environmental impact of wasted food? LP: Fortunately, there are no regulatory or legal barriers to our work. If anything, in Massachusetts we have regulations that support our work. In 2014, our DEP enacted a Commercial Organics Waste Ban which prevents large businesses from landfilling organic waste in excess of 1 ton per week. This has prompted businesses to seek alternate methods for processing organic waste, whether through donation, animal feeding, composting, anaerobic digestion, or other methods. At a national level, we support the work of Congresswoman Chellie Pingree. On a more local scale, a number of us working in the food policy space have connected to identify the legislative priorities here in Massachusetts, these include state level tax incentives, improved food labelling guidelines, and other initiatives. FT: What are some things individuals can do to reduce their personal food waste footprint? Plan your meals for the week—look at what’s in your fridge or pantry that needs to be used up and plan around that! Make a detailed shopping list—use your meal plan to draft a shopping list, and shop your fridge & pantry first! Serve reasonably sized portions—this helps prevent plate waste, people can always take seconds. Save your leftovers—package them up and label them so everyone in the family knows what they are and when they need to eaten by. Additionally, you can reduce your food waste by storing food properly in your refrigerator and freezer, making greater use of your freezer for items you won’t eat up quickly such as bread!